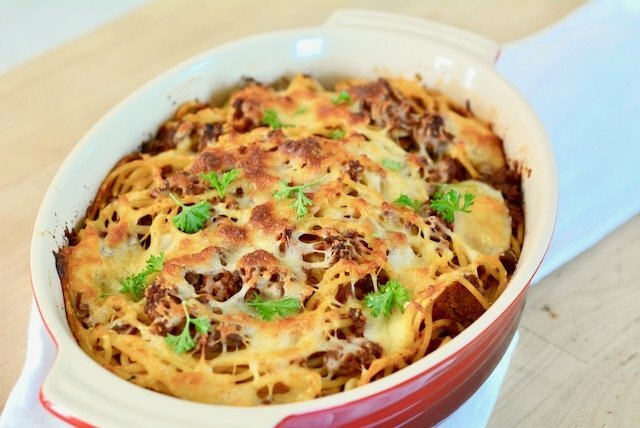 Introducing a spaghetti bake that is next level. In my household, September is always a bit of circus because I have to get myself back into quick weeknight dinner mode. During the summer we have the luxury of eating dinner late, but come the autumn season we are back on a tight schedule and the kids are hungry earlier. 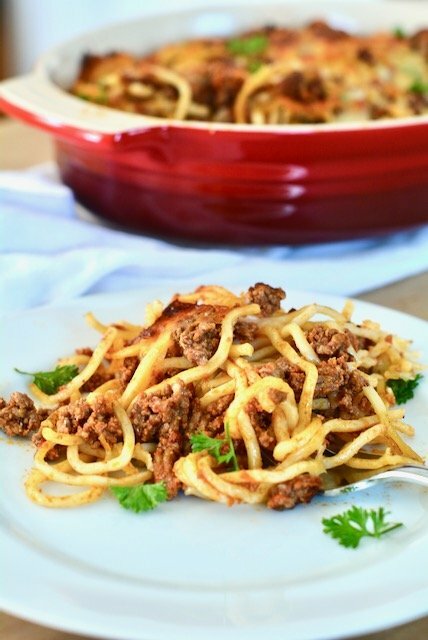 One of our go-to dinners is a spaghetti bake. With melted cheese, ground meat and tomato sauce, it’s a delicious make-ahead meal you can freeze. But I recently decided to take things next level and add some taco seasoning to the mix. 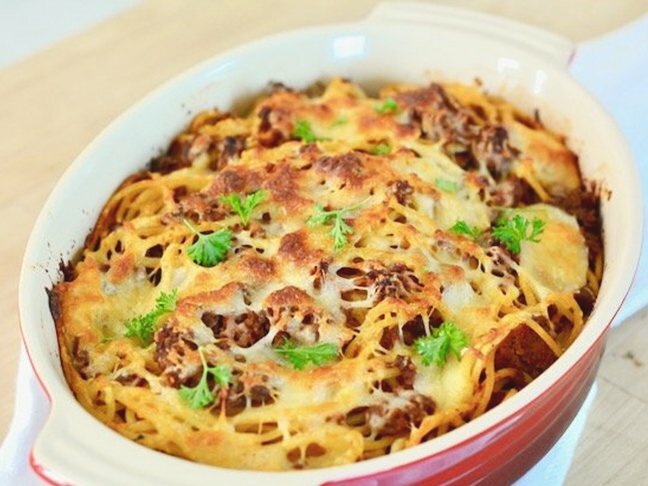 My kids love this taco spaghetti bake because it’s like their favourite taco dinner and spaghetti meal have joined forces to create the best dish ever. I like it because I can easily bake it beforehand and reheat it as necessary. I can also assemble it and bake it fresh if that’s easier. Either way there is no wrong way to do it! 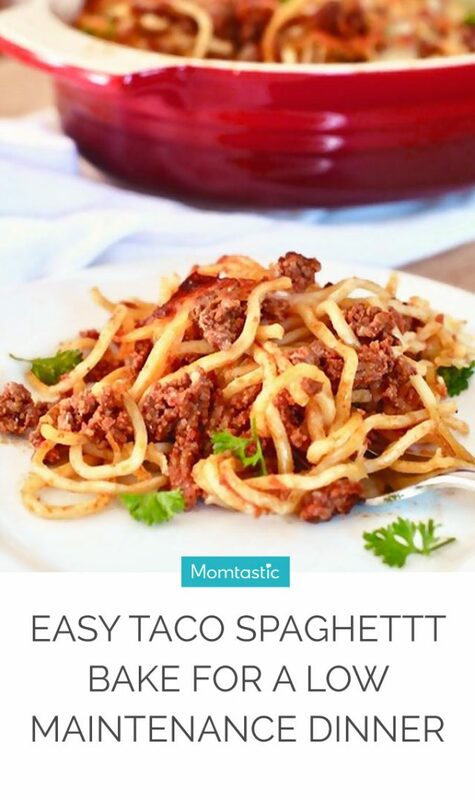 Follow my easy recipe below to make your own easy taco spaghetti bake. Throw together a salad and some garlic bread you have an amazing dinner ready to go in less than an hour. Step 1: Preheat the oven to80 degrees C. Spray a 13x9 glass baking dish and set aside. Step 2: Cook the pasta until just al dente, drain and set aside. Step 3: In a large skillet cook the beef and onion until the beef is cooked through and the onion is softened. Add the chiles, seasoning, and water and cook for about 2 minutes. Then add the tomatoes, tomato sauce, and half of the Mexican cheese and stir well. Then, add the spaghetti and fold everything together. Add the mozzarella cheese cubes and fold them all in as well. Step 4: Pour the entire mixture into the prepared baking dish and scatter the remaining Mexican cheese on top. Bake for 30-35 minutes, or until the cheese is completely melted, the top is brown and the casserole is bubbly. Garnish with coriander and serve warm!